One of my early teaware purchases was a 6 oz cupping set. I was inspired to do so after attending a Harney & Sons tea tasting* where professional cupping sets were used. When I prepared by teas in the cupping set, I did not do so with an eye to formally evaluation the smell, taste, and aromatic features of the tea. I liked the ease the cupping set afforded me in steeping and pouring my. This has changed with my enrollment in a tea education course. I am learning how to use the cupping set like a professional. I literally have a better handle on pouring from the set. Also, I received a 4 oz cupping set as part of my course materials and now I am able to evaluate two types of tea in the same family, for example, two Oriental Beauty oolongs, which are the subject of this post. I used 4 oz of 195F water in both the 6 oz and 4 oz cups. 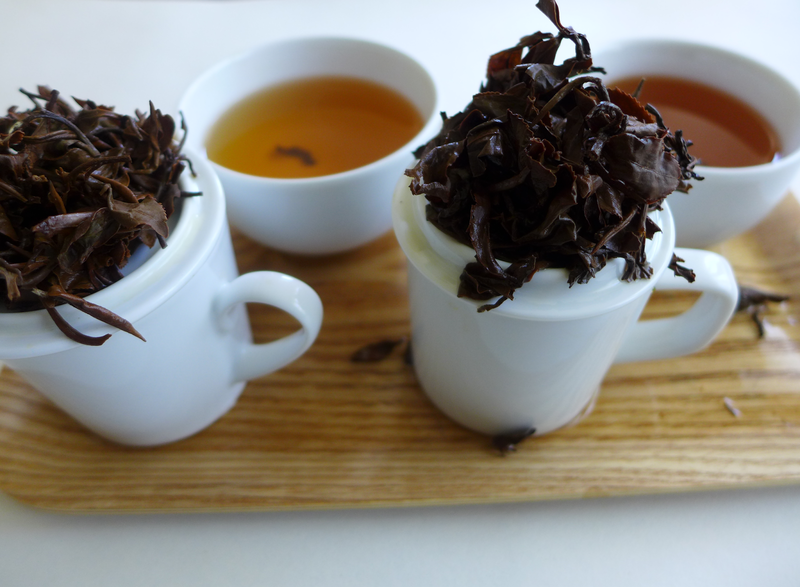 The Te Company Oriental Beauty Reserve was prepared in the 4 oz cup while the Adagio oolong was infused in the 6 oz cup. The Reserve is always pictured on the left when both oolongs are shown in the same photograph. I infused 2 teaspoons of leaf (recommended amount by both companies) for 3 minutes three times though this review focuses on the first infusion. Below I present my tasting notes of both oolongs using a modified tea assessment and sensory evaluation form. The second and third infusions all exhibited the smells, tastes, and aromas listed above. I like both of these oolongs. If you prefer a heavier, woody Oriental Beauty then the Adagio offering is for you. If you like a lighter, floral forward Oriental Beauty then try Te Company's Reserve. I would love to hear your experiences with Oriental Beauty oolongs. The Formosa Bai Hao was provided for review by Adagio Teas. I won the Te Company Oriental Beatuy Reserve in a Riverbed Books raffle. * You can read my tasting notes on Harney & Sons white teas, Chinese and Japanese green teas, Taiwanese and Chinese oolongs, and Chinese black and puerh teas. I am definitely looking forward to drinking lots of tea with you and at Te.